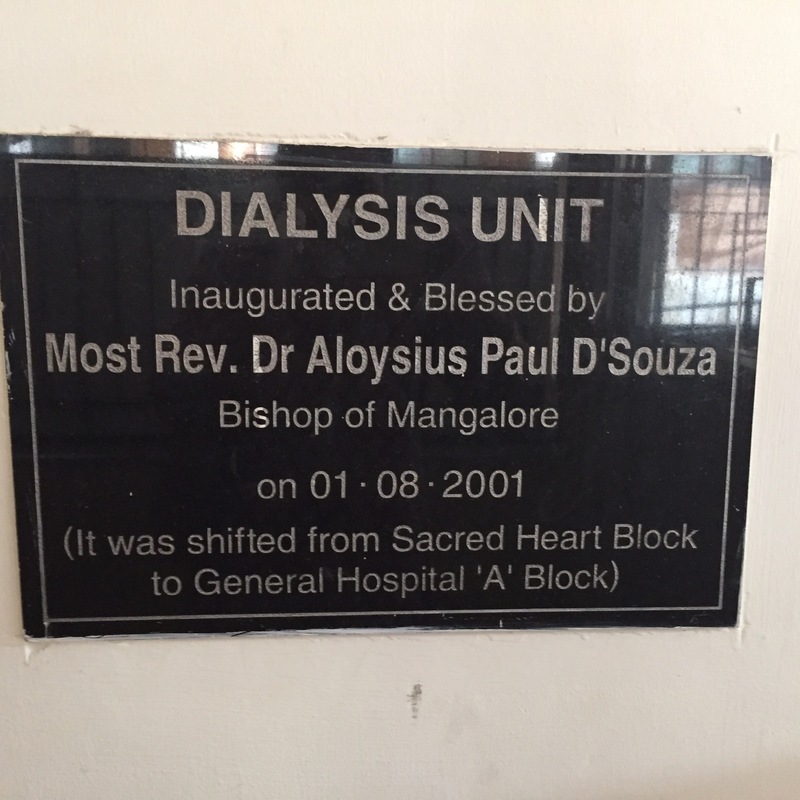 Dialysis patient in India -How 1000 rupees decide about your life – Go India, go future! 1000 Indian rupees, that means 14 EUR (!!!) decide if people can live or die. 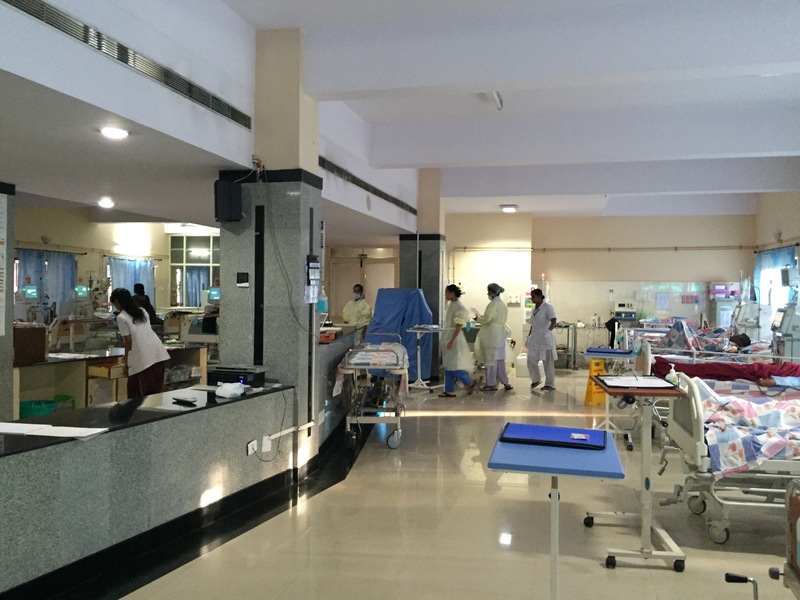 I have visited today the Father Muller Hospital in Mangalore. 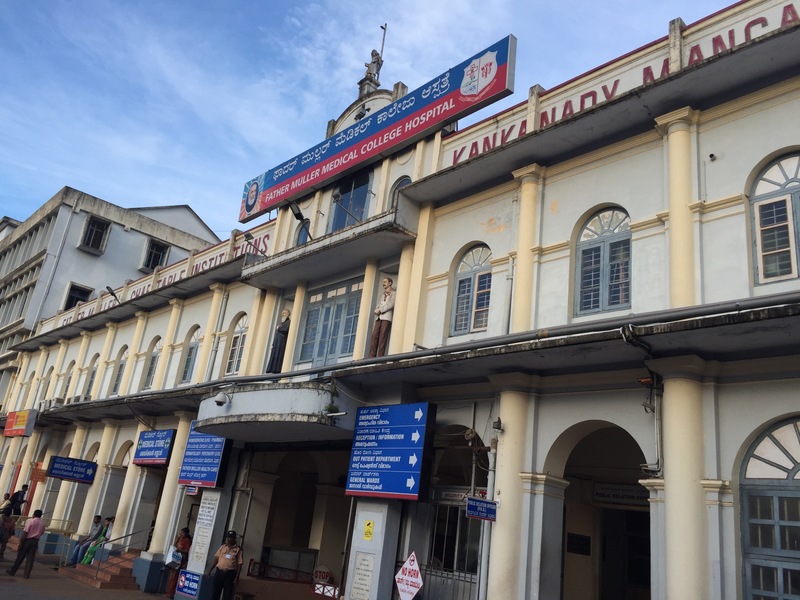 Founded 135 years back by a German priest is has become today one of the best hospitals in Mangalore, India. Mangalore is a city with nearly half a million habitants, port city and one of the fastest developing cities in India. Many multinational corporations and domestic corporations are opening their branches in Mangalore. Many reputed builders are bringing huge development projects. There is very good growth in the retail sector and many new shopping malls are being built. But the poverty is huge. Also in the hospital. When I visit the director and his team we go to the dialysis center. There are 22 beds and Fresenius machines available. The infrastructure is good, the doctors and nurses are working around the clock. Four shifts, 4 hours dialysis for every patient. Sixty to seventy patients per day. But there are many more in the surroundings who simply can not afford to pay 1000 rupees per treatment plus the costs for traveling here another 5,6 EUR. This means ideally calculating three treatments per week 240 EUR per months. But more than 60%of the population lives under the poverty line or slightly above. Even a nurse gains around 10000 rupees/month only. “It is not a problem to add 1 or 2 treatment machines, but we will not have more patients as they cannot pay. The number of kidney diseases is growing rapidly like in many other parts of the world, often caused by diabetes…”, says a doctor. A very young boy is getting a dialysis treatment in one of the beds. “He comes only every 12 to 15 days. His parents are not able to pay more. It is a question of a few months until he will die,”explains the nurse. “Who is rich gets a really good treatment, but the poor have no chance”, she adds. When we continue to visit the oncology center, the priest tells me that the hospital offers consultancy for 50 rupees, all kind of consultancy services included. The treatment then has to be paid extra. A chemotherapy / 6 week treatment costs in average 25,000 Rupees total. But 70% of all patients never appear. In Germany a one time dialysis treatment costs around 200 EUR, our health insurance system covers all spendings … What a good thing. I’m very glad to know that I can get a treatment in case of need. What if our dialysis patients would donate 5 EUR per months, build an international community and help patients in countries like India? What if in the Father Muller hospital two placements for tourists would be added? Many dialysis patients can travel around the world and get good treatments. Not in India. Here it is simply not possible. But these holiday patient treatments are paid by the national health insurance – the real costs are 1000 rupees only. If 190 EUR are paid there is a difference of ca 11000 to 12000 rupees what means one tourist treatment cover a 1 month treatment of an Indian patient. It’s not the overall solution, I know. But it is a starting point. At least it could become an income source for the hospital to save some others lives, too.